A little insight to my daily activities. Gonna start something new.. an mp3 of the week. Ok, this week's mp3 falls under the ever so popular anti-war theme going on right now with most popular bands. This track quotes Jean-Paul Sartre "when the rich wage war, it's the poor who die" and this becomes the theme. This is track seven on the new Linkin Park album Minutes to Midnight. The track is called "Hands Held High". Lyric Warning: A few F bombs.. but how can you talk about war without a few bombs? ..looked so forward to a freakin television show as I do now. TONIGHT.. LOST SEASON THREE 2 hour FINALE! Come over for the high def version.. you know you want to! Irritating Rose and her annoying husband.. gonzo.. gonna bite it in the battle. "The Looking Glass" refers to the sequel of Alice in Wonderland where there is mirroring and time shifting. Also why the logo for the looking glass station is a rabbit..
Mr Negativity aka Jack MIGHT .. might.. be killed in endgame battle with Ben, hopefully anyway.. he's about as annoying and irritating as Rose and her husband. Ben is not going anywhere. He makes the show.. the perfect villian. As much as I don't want to see their faces anymore, I think Michael and his psycho son are coming back.. If he does, I kinda hope he dies for his back handed betrayal of his people. I think smokey is going to participate in the battle.. siding with the losties. So lots of death and mayhem. Gonna be good.. ooo yea.. gonna be good. There seemed to be an overwhelming feeling of guilt for playing a game of poker on a monday night after the big tourney night on friday. Why do we feel this way? It is any different than going out for a beer with a bunch of guys where all our money goes to the bar, and our bellies get stuffed with obligatory pints and greasy foods? Instead, we get together for a beer in a friends garage and eat yellow peppers, italian roma tomatoes. cucumbers and wash it down with an apple cider. Obviously the better choice. Now, a bunch of guys getting together to eat veggies and have a beer or cider, and there happens to be a poker table loaded with cards and chips. What better way to spend time? Time with good food, good people and a good game. This, in my opinion, is the best way for guys to spend together. Think about this --> pool halls and golf courses. Guys don't like much to just sit around and gab, we need to be doing something. Some kind of competition. The problem with Pool Halls and Golf Courses, they all require a lot of skill and a lot of practice. Poker on the other hand, is a unique hybrid of skill and luck. It takes very little skill and time to learn how to play, a total rookie can sweep a 20 man tourney, beacuse he's getting "good cards" or "getting lucky" and yet the skill part of the game is a tantalizing potpurree of calculating odds, reading players, manipulation, getting into the heads of players, and mastering the meta game. Poker is an intimate game. The feeling of sitting at a table with stacks of chips in front of you is empowering, and winning a tourney is gigantic! you've out-smarted, out-played and out-drew everyone there. It's the reason you came. Yea there's a time for pool halls or golf. But for cost and convienience, poker can't be beat. These are my thoughts. I'd like to hear yours. Click on the comments line below this message and let me know you think. If you don't have a blogger account, just click anonymous when posting, but throw your name in the comment somewhere. How do I feel different? VERY Interesting things have been happening to me as a result of Ray's Oatmeal challenge. Colors are becoming more brilliant. I don't know if this is just a coincidence, but I'm starting to notice green grass, colorful blooms in the trees, and bright yellow and red tulips have somehow appeared in the back yard. It's staying light longer. I was noticing this the other day when I was at Mike and Cathy's for dinner. It was 10pm and still appeared quite light out. Nice. I like! Do you like? Gave me a reason to blog again..
My KIDS have become smarter, and inquisitive. "Dad, what is that you're eating?" "It's Oatmeal" "That doesn't look so good, it looks bruised" "That's the blueberries" "It looks gross" "It's actually not that bad" "You're lying to us" "Want to try some?" "Yea, I want to try that like I want to try mixing barium hydroxide octahydrate crystals with dry ammonium chloride.. no thanks Dad." Allowing me to come the undenial conclusion that Jacob is actually a time spliced version of JOHN LOCKE. Yea, that's right.. Jacob = John. If you don't know what i'm talking about, watch Lost. Learn Lost. Love Lost. I became an anagram machine. I can find hidden messages in almost anything you throw at me. For example.. an anagram of OATMEAL is "EAT LOAM" and if you think "UNFIT ANABOLITIC BIOLOGISM " is just a fluke that it's anagram is "SUBLIMATION BLOGIFICATION" you'd be wrong, way wrong my friend. Don't underestimate the anagram machine. I rock the khasba, over and over, and then.. when I'm done.. i'll rock it again. I don't wear sunglasses as much as I used to. Mostly due to the fact that I forgot where I put mine. Figured out what a "Khasba" is, you know from the song, Rock the Khasba? Well turns out it's actually spelled "Casbah" and it's a castle or palace in northern Africa. Who woulda thought. "Now over at the temple Oh! they really pack em in. The in crowd say its cool to dig this chanting thing. But as the wind changed direction, the temple band took five. The crowd caught a wiff of that crazy casbah jive"
AND THE NUMBER ONE CHANGE OATMEAL HAS MADE TO MY LIFE..
Made food tastes better, way better.. well.. compared to oatmeal. In Oct 2002, after 40,000 entries from 70 countries and 2 million ratings, the above joke was considered to be the official world's funniest joke. Last night, we're playin' a little poker with the boys, and for some reason Ray mentions something about the SNL skit of 2000 called "I gotta have more cowbell". I've never seen it so I am not participatory in the laughter which follows. Then Dan, gets out his cell phone and tells us we have to listen to something, and it's a voicemail recording of his brother in law from earlier that day saying, "DAN, I gotta have more cowbell" ok... as if that's not freaky enough.. it goes on. 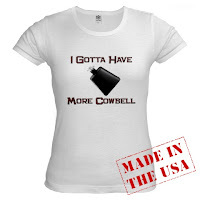 "I am listening to "more cowbell song " in a supplier right now. Crazy world man!" Two occurances... coincidence.. Three occurances.. Something's going on here but FOUR??? Undeniably out of world system sending a message, warning perhaps. So of course I have to analyze the phrase "I GOTTA HAVE MORE COWBELL"
Now.. what you are about to see will surprise the hell out of you. Cause it's undeniably true. I solved the puzzle. If you take all the 21 letters from the phrase "I GOTTA HAVE MORE COWBELL" and re-arrange them, not adding any letters or taking any away (an anagram).. you get... this.. Please! Count the letters! Prove me wrong! it's a direct anagram! If there is one thing for certain here in Calgary, it's this: If you don't like your job, you can get a new one. Yes, that's right; you can work where ever you want. Ok, what does this mean? This means that if for whatever reason you don't LIKE YOUR JOB, feel free to throw in the towel and find something which MAKES YOU HAPPY. The worker, err.. "sandwich artist" who prepared my sub did not like her job. She was not happy, and she decided to be not happy to my sub. You know how they nicely lay the cheese slightly over lapping, careful to cover the whole sub? Not angry lady.. no... she throws two pieces of cheese in the middle of the sub. I say.. "you think you can spread those out a little" while doing the open-the-tent-door action with my hands. She took great offense to this and the rest of the veggies went on with a violent release of deep-seeded suppressed religious petulance. Then in a surprise attack mustard was blown all over it with a terroristic blast. I didn't even ask for mustard, but I knew I wasn't in control anymore. It was then wrapped in a C4 napkin and thrown into the bag, timer set to zero. It's not my sub's fault you don't like your job, and it certainly isn't mine. Why, for the love of everything sacred, are you working there?? Why don't you try next door maybe at the Pianni's Pizza.. or perhaps at the ONE POINT TWO MILLION OTHER JOB OPENINGS IN CALGARY??!? THAT WAS NOT A SUB YOU MADE ME, THAT WAS A PLASTIC BAG FULL OF SUICIDE SEAFOOD EXPLOSION! I didn't make a stink about this, I was with co workers and had to maintain my sense of professionalism. I ate it anyway.. but there is something to be said about presentation. Picture a sandwich, all nice and cut nicely.. mmm yummy.. now picture that sub smashed and smeared up on a window.. same ingredients, not so yummy, no..not so yummy at all. All cause someone doesn't like the job. Get a paper, pick up a phone..get a new job. 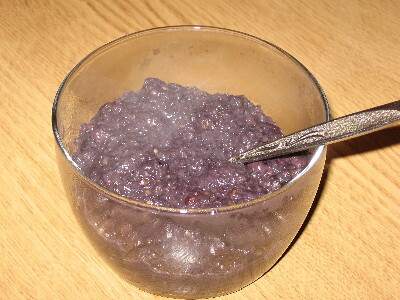 Blue berries make the oatmeal purple. five days out of five days. I have been challenged by my brother to eat a bowl of oatmeal every morning for sixty days. I took the challenge. I am on day four. 56 to go.. easy challenge. I should challenge Ray to sixty days of not using the F word. I have the better odds. I just ordered a large coffee with two milk and two sweetener. What the heck... is the matter... with me... Oatmeal. More later.